When not teaching and serving, I’m trying to get some researching done on the side. The small chunk I’ve been working on of late is examining how contemporaries discussed the surrender of the French garrison at the citadel of Tournai in 1709. Reminder to self: this takes forever if you have 100+ accounts to go through (and that’s only for Tournai). The garrison could be given an “honorable” surrender (the standard phrasing used), which meant that a variety of symbolic “marks of honor” would be granted the garrison upon its evacuation – things like drums beating, flags flying, &c. Most importantly, the garrison would be allowed to return to action by rejoining their field army. Alternately, the garrison could be denied their status as free combatants, and taken prisoner. Within this broad imprisoned fate were several important gradations, however. If a garrison was “taken prisoner”, the capitulation might dictate that the garrison be exchanged immediately, or the capitulation might remain mute on this point, which meant that the garrison might instead linger until a later point. Sometimes prisoners might be allowed some of the marks of honor. Distinct, however from a garrison taken prisoner, was one taken “at discretion”. Hard-pressed defenders taken at discretion still ended up prisoners, it’s true, but taken “at discretion” was the early modern equivalent of unconditional surrender. This was a far more shameful way to be captured, and more dangerous, for their treatment was technically at the discretion of the commander. There was, in other words, no capitulation document that provided written protection for the garrison (or almost never – like I said, these things are complicated). Nevertheless, contemporaries made clear distinctions between defenders taken prisoners and those taken at discretion (unless of course one side wanted to inflate their own honor by blurring the lines – it gets complicated). So while there’s definitely a fair amount of gray, it’s completely confusing for Coxe to say that the garrison was taken at discretion yet they were given the honors of war. It’s possible there may have been some garrison somewhere that received such mixed terms, but I’ve yet to see one, and this certainly wasn’t the case with Tournai. Keeping (only) their swords and baggage was a significant step down from being allowed the standard marks of honor – I don’t think contemporaries even referred to “swords and baggage” as “marks of honor” (though I’d have to check to be sure). The worst fate of all was to be put to the sword. Defenders that resisted to the bitter end would likely be slaughtered in the breach or in the streets. This fate became increasingly rare as the 17C progressed. Yet this leaves us with a problem. Coxe was born in 1748, and therefore lived as an adult through several of Europe’s wars of the late 18C and early 19C, all of which were covered in the British press. So why didn’t he know the difference between prisoners/discretion, and between the various marks of honor? Had these conventions changed by the end of the century? (Just what I need, the suggestion that I have to look at even later discussions of surrender conventions. Ugh.) Or maybe the Archdeacon was a clueless pointy-headed prelate, armchair quarterbacking without an understanding of the conventions of a previous generation? Or was he just being literary and trampling historical understanding in the process? So I’m not sure what the lesson is, other than to pay closer attention to the language used by contemporaries. But that’s a good lesson to start with. What is this reciprocity of which you speak? In the debate over cultural vs. practical explanations for military behavior (assuming we need to prefer one over the other), the concept of reciprocity will undoubtedly surface. It’s frequently used to explain why some combatants broke real or apparent ‘rules’ of war, or otherwise violated expected norms of behavior. Often times it’s used to excuse bad behavior: soldiers, for example, may have done something that might be considered ‘bad’ in some circumstances, but they did it only after the other side did it first, or only after the other side’s past actions (or maybe just one action) made it clear that a more acceptable response was too dangerous to their own troops. In other words, their response was not conditioned by culture (e.g. a cultural hatred of the Other), but by pragmatism, maybe a rational desire to avoid casualties, or perhaps punishing the enemy for similarly bad behavior. You also see reciprocity come up a lot as a mechanism when discussing the “laws” of war – that reciprocity was one of the key factors limiting excessive violence. 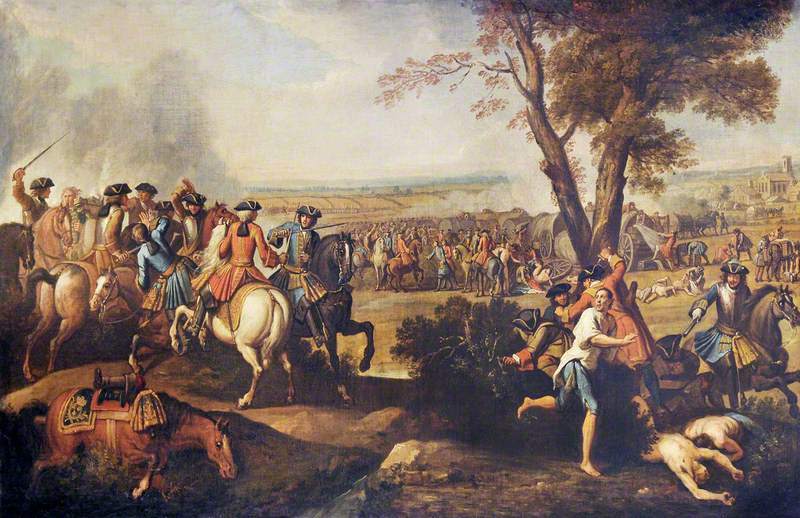 In the early modern context, reciprocity is often alluded to when describing how the post-Thirty Years War period became a period of “limited” war. I admit I don’t have a really clear grasp of how exactly it worked on the ground, particularly in a conventional conflict between European states, and particularly how it was supposed to work over time. So here are my initial thoughts (and questions) about how military reciprocity was supposed to work in limiting early modern military excess. Somebody should write a book or article just on this, preferably a case study. Maybe somebody already has, in which case, let me know in the comments. I just hope I don’t have to read too much about MAD. Consider this a historian-in-action thought piece, where I speculate on method, and whether I am convinced by an argument (that I haven’t read) based solely off of tea leaves offered by the author. And no, historians never ever make such summary judgments based off the slightest of evidence. Gripping (griping?) stuff. Apropos a recent post on footnoting and historical evidence, I read an interesting yet odd interview of historian Tom Reilly (author of Cromwell: An Honourable Enemy and Cromwell was Framed) about his crusade to rehabilitate Oliver Cromwell (and his warts). Here’s the blog link – there’s a pop-up ad that you probably want to ignore, and you might want to check/clear your cookies after you’ve left the site if you have lingering doubts. A self-proclaimed “amateur”, Reilly portrays himself pitted against politicized Irish academics, pedants who snipe at his citations rather than engage with his irrefutable evidence that Cromwell was dishonorably framed for murder. An interesting idea, though admittedly only one recent example in a series of revisionist histories seeking to rehabilitate Bad Guys of History. Unfortunately I don’t have the expertise or knowledge to settle whether Cromwell really ordered (or allowed) hundreds of Irish civilians to be slaughtered at Drogheda (you out there Wayne Lee?). For broad context I’d probably start with The Massacre in History, The Age of Atrocity (pp 251ff discuss Reilly’s claims as it turns out) and Theatres of Violence. Nor have I taken the time to do much research on either Reilly or his books. That doesn’t, however, prevent me from wildly speculating about the ideas at stake. I am particularly intrigued by the broader issues raised in the interview and the publisher’s (Chronos Books) website. If you’ve read the above-linked interview, you too may have quickly been put on guard after an initial anodyne question about the origins of Reilly’s interest in Cromwell (he lives in Drogheda, site of the most infamous of the Cromwell “massacres”). By the second question the interview quickly descends into an attack on those damn academics: “Describe how difficult it was for an amateur writing in the current formally academic controlled climate.” Hey, that’s my People! As someone who’s complained far too often about the dominance of amateur popular military history in his own research area, I hadn’t really considered there would be people complaining that published non-fiction works were vetted by experts in the field. Score one for the publishers-as-gatekeepers side, I guess. In response to this question about the difficulties of an academic-controlled publishing climate, the interviewee spent a surprising amount of time complaining about the last thing I would have expected: the difficulty of footnotes. Turns out his press editor insisted he go back and add footnotes for all his sources, requiring him to imitate a variety of footnote formats from other books. My initial thought was that he should justifiably complain if his press didn’t provide him with a style sheet. But more eye-catching was that he interpreted the arcana of footnotes as a painful and unnecessary introduction to the “bewildering world of academia.” Looks like history publishers get criticized no what matter what they do: for not including enough footnotes, or demanding that they include any at all. One more point for the publishers-as-gatekeepers. …”amateur historian Tom Reilly again throws down the gauntlet to professional historians everywhere. This book contains original and radical insights. Odd. In general, I certainly second his desire to see more quoting of sources and less politicization in academic history. But in this case the tone of both interview and publisher website strike me as rather counter-productive. Unless you want to sell controversy of course. All of which leaves me with numerous questions I’d pursue if I had the time. Many of the questions that immediately come to mind leave me a bit skeptical of Reilly’s case as soon as I voice them. Does the fact that English writers were “much more circumspect” about Cromwellian massacres than Irish authors provide evidence that the Irish authors were wrong, as Reilly apparently believes? More strangely, have historians been jealously hoarding shiny primary sources from the general public, like some fire-breathing dragon? On this I’m pretty certain the answer is “No”: many of you know that it’s those who donate documents to the archives, and the electorate who doesn’t want to pay more taxes to publish these documents, that deserve most of the blame for those documents that are hidden. Every historian I know would love for all such documents to be freely available, and I can’t imagine there are many Irish historians who would protest greater dissemination either. Where Reilly interprets footnotes as an arcane secret language which only a cabal of professional historians and their acolytes can decipher, academic historians see them as quite practical attempts to actually encourage transparency. ‘None of this is convincing’ said the Irish Times. ‘This is a painfully bad book’, said Dr Jason McElligott and he followed up with, ‘and it is tempting to suggest that its main use will be to teach students how not to conduct research, assess evidence or write prose.’ I [i.e. Reilly] was stunned. ‘But, the evidence, I cried. Look at the evidence’. If one of my students were to respond to the Irish Times‘ critique by saying “But look at the evidence,” I’d probably suggest to that student that in order to rebut a criticism that you didn’t assess the evidence properly, you should do more than just reaffirm your contention that the evidence is self-evident – perhaps discuss what types of evidence were available, and evaluate their reliability. For that matter, I’d tell the hypothetical student that the historical evidence for an emotional topic like a massacre can be interpreted “without prejudice” only with great difficulty. I’d even suggest the student consider the possibility that those human beings creating those documents (hidden or not) might themselves have had opinions and prejudices of their own that deserve investigation, frames of reference that might influence what (and how) they remembered events. I have no idea if Reilly does just that in his books, but his alternation between martyrdom and bomb-throwing radical makes me wonder. To play the pedant, I’ll assume Reilly’s unfamiliarity with academic history means he doesn’t realize that even with transcribed documents, you still need some method of indicating their location for other researchers that might want to return to the original, or ask an archivist to make a copy. The selection of which extant documents are worth consulting (and why) requires contextual interpretation. Deciding which types of archives and documents are relevant to your research (and the exact framing of your research question), is itself interpretation. Numerous aspects of every document – from the genesis of the document to the author’s reliability to paleography to vocabulary to allusions to context to genre conventions – will necessarily require interpretation by those with specialized knowledge. Any evidence you extract from those documents will be of no import unless you frame them within a particular argument or historiography, which is again a matter of interpretation. What’s my point? Ultimately Reilly may be 100% right in every detail and every claim, though it’s quite possible that no conclusive answer is even possible (barring exhumations, and even then). But from what little I’ve read so far, I’m not the least bit surprised that academics have reacted negatively to his work. At first glance, all these impressionistic bits raise flags for this academic historian. 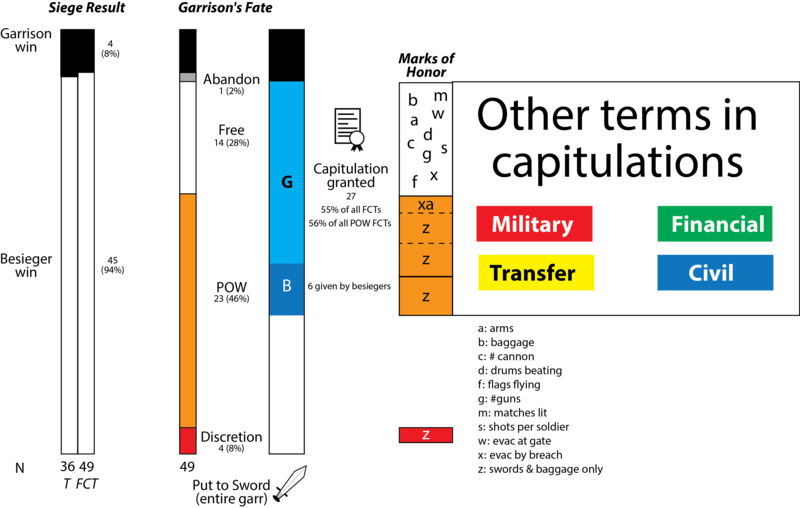 One of the tactics used by more unsavory revisionist historians has been to focus on some small, discrete historical event within a larger historical phenomenon, question the standard historical interpretation by producing some document (or challenge opponents to produce their “smoking gun”), charge that there is a conspiracy to keep the “proof” from the public (often despite acknowledging in passing that there has in fact been a long debate over the matter), and leave the implication that the larger event of which this was a part couldn’t have been all that bad if this specific incident wasn’t nearly as bad as we’ve thought. I have no idea if Reilly is intentionally doing this or not, and freely admit I’m in uber-speculation mode here. I would, however, be interested to hear his take on English activity in Ireland in the 1640s-1650s more broadly, or even on Essex/Mountjoy in Ireland (under Elizabeth), or William of Orange in the 1680s-1690s. Any thoughts on the Cromwell debate, or the broader issues raised about scholarly vs. popular history? Update: Just saw that Reilly posted his actual argument on the Trumpet of Sedition blog, which I’ll probably get around to reading sometime, and maybe even retract this blog post, or not. I’m trying to finish up one of my main projects this semester (the West Point military art textbook), and have come across yet another example of the dead (and wounded) on early modern battlefields. 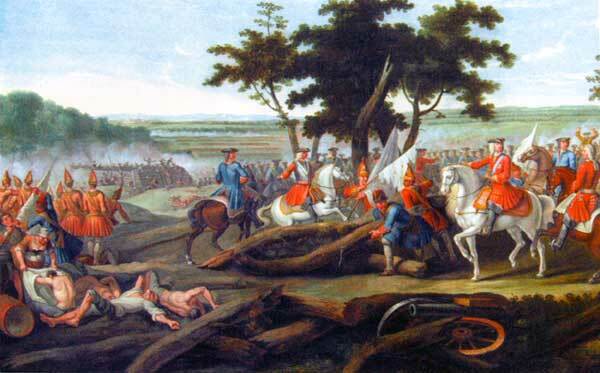 In a few near-contemporary paintings illustrating field battles during the War of the Spanish Succession (when else), there are several very prominent dead bodies, stripped naked. I want to use one (of the paintings, not the dead bodies) in my chapter, but will undoubtedly need to explain in the caption why those naked bodies are there. Note the dead bodies (at least partially stripped) in the foreground right and the proximate sword and pistol play around the tree. The (presumably dead) body with arms sprawled ‘up’ appears to be totally naked, his privates shielded from view by a conveniently-placed bush. Presumably the other victim’s blue pants link him to one of his still-living compatriots fleeing for his own life, sans shoes or any other accoutrements. I’ve heard of throwing down your weapons and equipment to flee, but that’s a bit much. Notice on the left how a female camp follower is taking the shirt off of a wounded/dead soldier with some combat in the background. I knew that the wounded/dead were often stripped after the battle; I guess I didn’t appreciate how quickly such wealth was redistributed. The early bird… I guess. This last one is a bit more surprising to me, given how close the dead bodies (center left) are to the fighting. If accurate and not simply an artistic convention, it suggests the possibility that stripping the dead might have happened even in the midst of combat, presumably by soldiers. Is that likely? Or is there some other explanation? There is clearly some significant fighting going on around it, which makes one think it isn’t the mop up phase of the battle, unless there was a lull and then a return to fighting. Perhaps it’s noteworthy that there appears to be a soldier over the bodies and not a female camp follower? 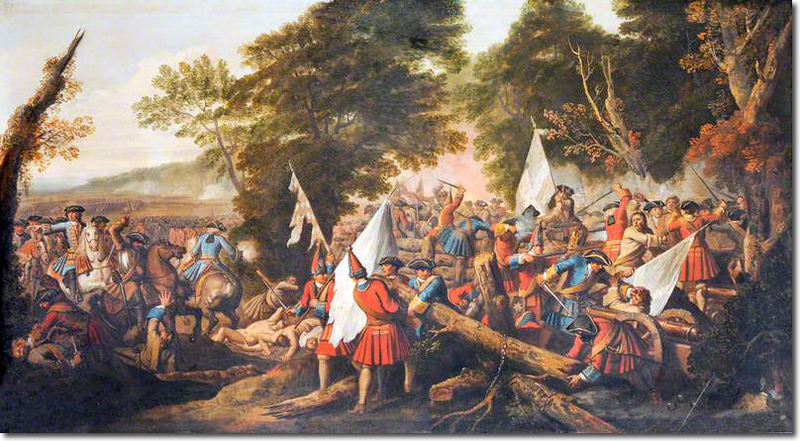 Perhaps the wooded terrain of Malplaquet made it easier for people to avoid the heaviest fighting yet still claim their prizes? Any thoughts, examples or parallels? If anyone has access to those expensive books on war in early modern art, they might give some guidance too. Back in high school I was first introduced to the rather devious idea that a combatant might desire to wound an enemy rather than kill him outright. The idea was that, even if the wounded soldier wasn’t used as a decoy to draw additional forces into a killing zone (a staple in war movies), more resources would be expended caring for that casualty than if they were simply killed in action. I think I probably heard about it in the context of the Vietnam war (punji sticks or some such, maybe small mines that incapacitated rather than killed outright). Seemed logical but cold-hearted. So as I started looking at my primary sources that contained the word “bury” (thank you database and full text), I came across this quote, which not only evoked early memories of human cruelty, but which also serves as a reminder that anything we can do, the pre-moderns could do too. As a side note, the personality of Richard Hill shines through the quote as well, particularly his glee at French suffering. His historical recognition of Italy as the burial ground for generations of French soldiers is also a nice touch. Unless you happen to be French.